Changing or repairing a flat tyre at the roadside can be a thing of the past. 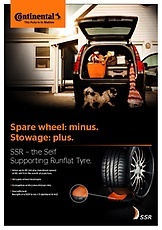 The Self-Supporting Runflat (SSR) technology is based on a self-supporting, reinforced sidewall. When there is a puncture, the sidewall prevents the tyre from being crushed between the rim and the ground or slipping off the rim, an occurrence that can make it impossible to fit a spare. An SSR tyre not only takes the danger and inconvenience out of punctures, it also helps with fuel efficiency and frees up interior space in your vehicle. With four of these run-flat tyres fitted, carrying a spare tyre in case a flat needs a puncture repair is no longer necessary. This means less weight and improved fuel efficiency as a result. It also adds up to 80 litres of free space in the boot. 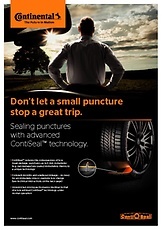 At Continental we highly recommend a fitment of run-flat tyres on all four wheels, ideally installed at the same time to ensure equal tread and air pressure. However once a run-flat tyre has been damaged, rather than being repaired, a new tyre will need to be fitted. A run-flat tyre has a reinforced sidewall that prevents it from losing pressure and becoming flat. This ensures the driver can continue driving the car for up to 50 miles at a maximum speed of 50 mph, rather than having to wait for tyre repair or the fitting of a new tyre. When a puncture occurs with a standard rubber car tyre, the sidewall can be crushed between the rim and the ground, creating a flat tyre. This can cause a potentially dangerous situation like a tyre air pressure blowout. The tyre may also slip off the rim of the wheel, which can make fitting a spare impossible.